Horseshoe, a nondescript blob from many angles, is named for the striking glacial cirque on its east face. The Boudoir Couloir, leading up this cirque to just south of the summit, is a moderate snow climb that makes this peak more interesting. Driving around from Leadville, I took the approach road as far as I could, then retreated to National Forest land to camp. 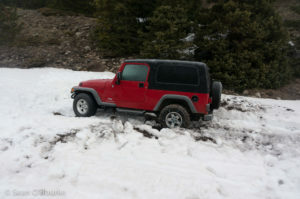 Retracing my steps the next morning, I stupidly managed to wedge myself in the ditch while turning around, but was fortunately able to get a quick tow from another party at this popular trailhead. After passing a thoroughly-wedged jeep (Cali plates, natch), I passed a familiar decrepit building and realized that this was the same road where a young Dr. Dirtbag had spent an hour digging his Celica out with an ice axe. Beware Fourmile Creek, folks! The day started out looking okay, but mists soon rose from the east while clouds approached from the west, and I was hiking in a mild snowstorm by the time I turned off the main road up toward Mount Sherman. Continuing up this faint road, which passes numerous summer cottages on its way to the Peerless Mine, I spotted two figures ahead of me. I caught up to Jay and Brian near a buried tarn, where we exchanged 14ers.com handles, then continued together toward where we hoped the couloir might be. Once we identified it, I left them while they prepared for the climb. I found mostly good snow for kicking steps without crampons, using bits of old tracks and glissade paths where appropriate. 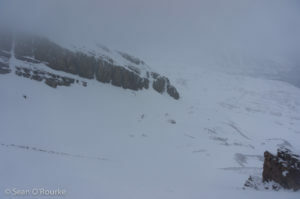 The couloir seemed to have slid during the past couple of warm days, but was quite solid in the current storm. 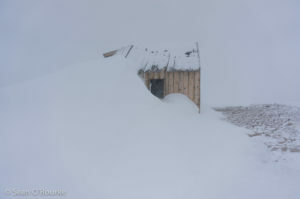 Some slogging later, I topped out to a whiteout on a broad plain somewhere near the summit. After scratching an arrow into the snow pointing toward the couloir, I turned right, then made my way left around an unexpected cornice. This path led me straight to an old building at 13,800′, which turns out to have been the bunkhouse for the hardy miners of the Peerless. 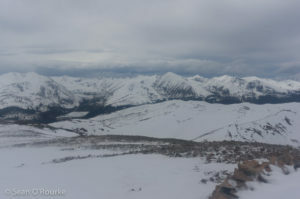 From the bunkhouse, I headed roughly uphill until I saw something I took for a summit cairn, then carefully retraced my steps in my uniformly gray world. 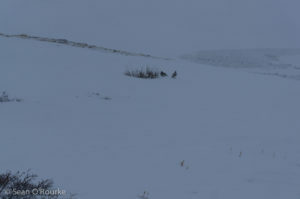 I chatted a bit more with my companions on the way down the couloir, then made my way back roughly along the old road. I saw two other people and a dog in the distance, but was otherwise alone in the silent snow, except for the occasional skree-cluck-cluck-cluck of a ptarmigan. I somehow ended up on a different road, passing different summer cabins, but was soon back to the “main drag,” and thence to my car. 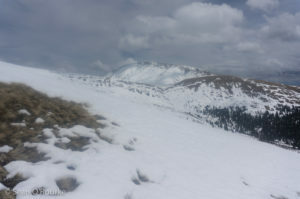 Continuing to Fairplay, I stopped just long enough to get online and figure out how to reach Mount Silverheels, then continued to Hoosier Pass, which was the trailhead for the most likely-seeming route. Sitting across Hoosier Pass from the rest of the Tenmile Range, Silverheels shares little of those peaks’ character, looking more like a classic Sawatch talus-pile from all sides. One thing that does give it a Tenmile feel is the high voltage line passing to its west, likely the same one that crosses next to Dyer. Leaving the car around 1:00, I snowshoed east up the boot- and ski-path, then made my way across rolling terrain in the general direction of the peak. I saw one skier ahead of me, but he apparently got scared off by a brief squall. Dropping too low, I floundered through the willows warned about in the online route description, then booted my way up one of the ribs on Silverheels’ northwest face. Eventually reaching the summit ridge, I slogged across numerous false summits to the true one, where at least I had more of a view than on Horseshoe. I dropped down sooner and took a higher line on the return, passing under the power line where it crosses a saddle west of the peak, then side-hilling around some bumps on the way back to Hoosier Pass. It probably would have been more efficient to follow the top of the ridge, but my growing fatigue pushed me to avoid elevation gain and loss. 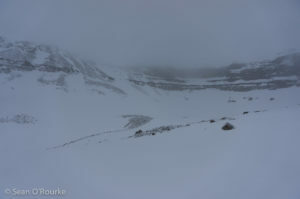 Unfortunately, there was nothing I could do to avoid the softening snow this late in the day, so the last part of the hike was, even on snowshoes, a postholing mess. Oh, well, I got ‘er done.